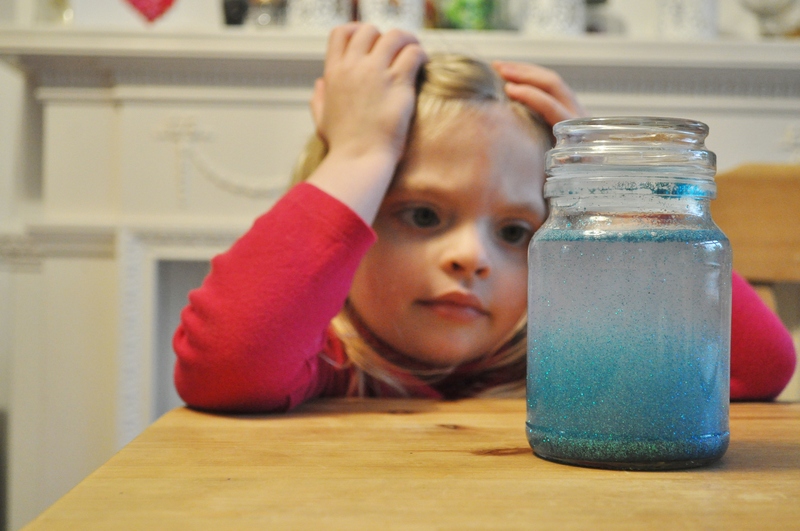 Today we made a calming jar especially for those occasions when your child or even ‘you’ are feeling a bit stressed or upset and need to take a few minutes to calm down. 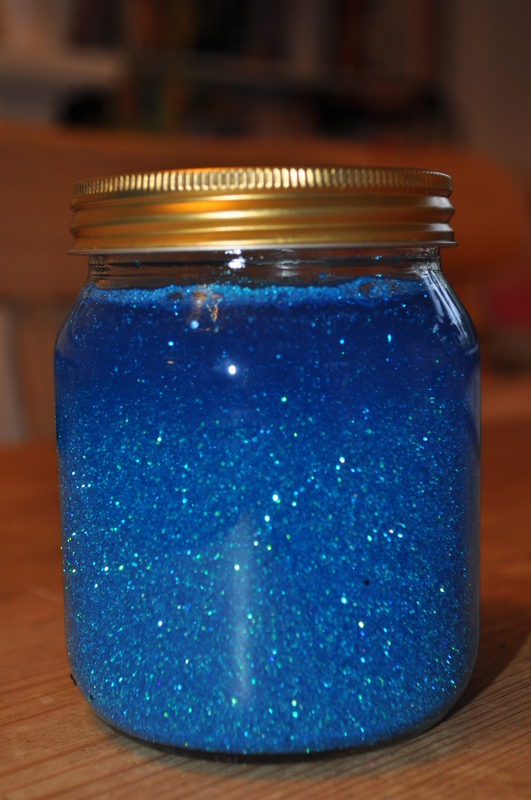 You just shake it up and watch as the glitter swirls around and falls gently to the bottom. If my girls get upset or have an outburst I’ve been teaching them to take a few deep breaths and I count with them and by the time I get to 5 they have generally calmed down at least enough to tell me what the problem is so this really is another way of doing that but so much prettier. Add the glitter glue and stir, stir, stir. 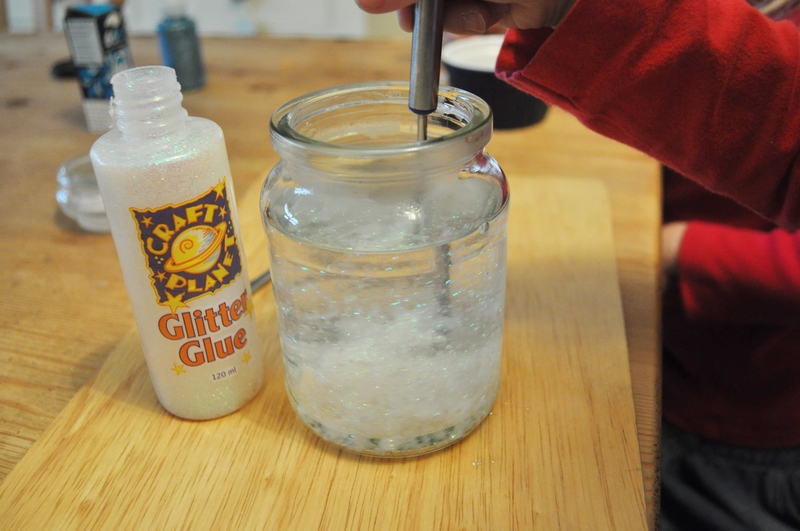 The hot water will break up the glue and this is what will make the glitter move slower. Add the glitter and screw on the lid tight! Do not use a jar with a push on lid – I tried that the first time and it fell off mid shake even with my hands over it….I really needed to use the calming jar at that point! Then I added a drop of food colouring and swapped the jar! 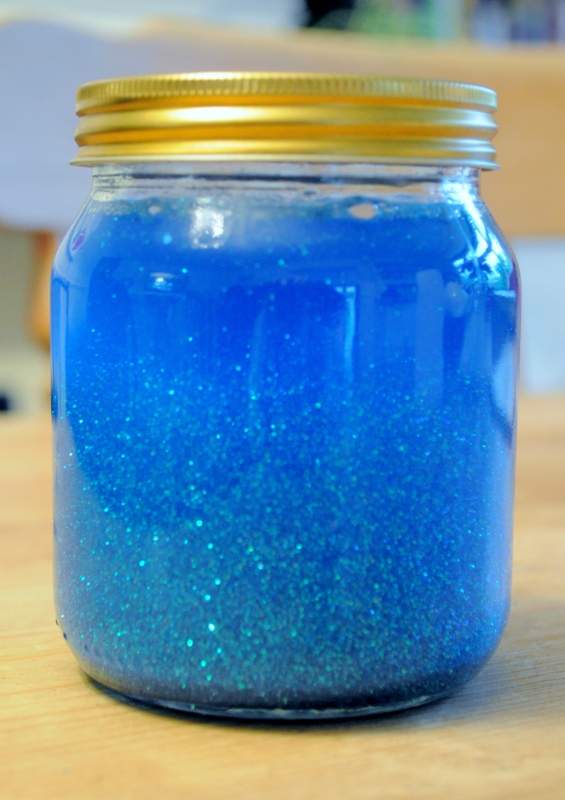 The food colouring makes it really vibrant and I think the blue is really quite calming. 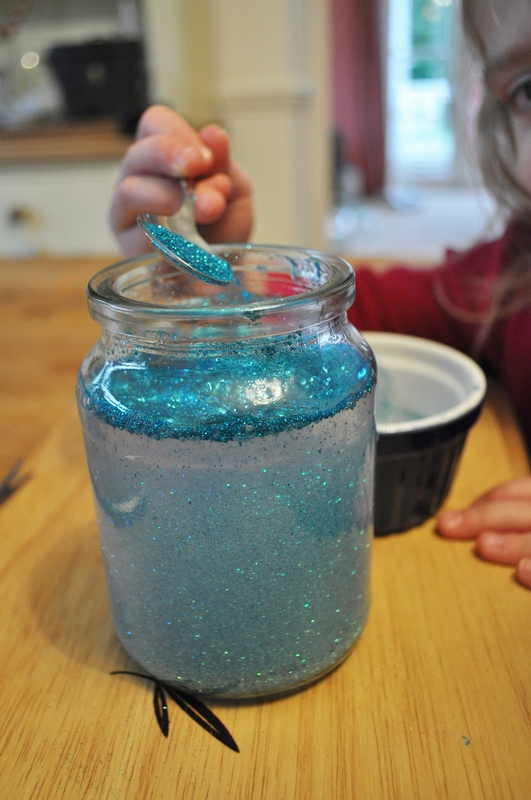 The amounts of glitter/glue you will need will vary depending on the size of the jar just don’t put too much glitter glue in or it will be too slow-moving and if you do then maybe add some bigger sized glitter that will fall quicker. I used very fine glitter and it takes a good few minutes to settle. Either way you can add more of each until it looks about right. Some people use these as a Time Out aid so when the glitter has settled the child can join back in. I would probably avoid giving the jar to a tantruming toddler who may throw it; a plastic jar maybe safer for younger children. You could also use it for anxiety to take their mind off a problem for a moment or these can be used for adults if they are seriously stressed out and need to calm their thoughts. This entry was posted in Tutorials and tagged calm jar, Calming jar, glitter glue, glitter jar, meditation for kids, potty training on January 18, 2013 by gembelina. What a great idea! Brilliant way to get little ones to talk about and consider their emotions, and so simple to do. Love this! I know some little ones who might like this! Thanks for this! I made one for the potty training method I’m doing (it’s recommended in the first few days while they are still just getting comfortable on the potty chair). One thing I found: I used a plastic jar, but the hot water warped it – especially when I had to pour some back out, the mouth of the jar got too warped to screw the lid on, so it ended up with glass anyway. If you want to do plastic, maybe do your mixing in another container, then transfer it when it’s cooler.